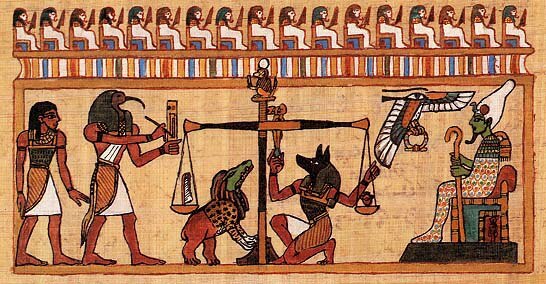 Egyptian mythology is most powerful when understood as a metaphor for our daily lives. This ceremony of transition from death to the afterlife is actually symbolic of any transition we experience in our life. Anpu is the jackel headed god that watches over the Heart Weighing Ceremony. He is the guardian of the crossroads, the opener of the way. You see, the crossroads IS the judgement. But Anpu won’t allow us through with our heavy heart. 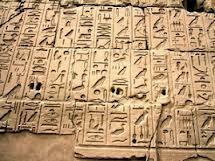 The ancient Egyptians considered the heart to be the centre of thought, memory and emotion. If our hearts are heavy with resentment, guilt, jealousy, sadness, and an unfulfilled Ego... we will remain at the crossroads indefinitely because we are not prepared to pass the threshold. If you are at a crossroads in your life... in any shape, size or form... if your prayer is “show me the way” ... you must try to find ways of lightening the heart as a feather. Can you find lightness in the heaviest of situations at home? Can you find LIGHTness in the dark corners of the room. Can you find love in the people that frustrate you the most? Can you serve when you are most vulnerable? Can you find the safety in the moment of NOW no matter how scary and uncomfortable the unknown is? How can we expect to master running in a race if we can’t even transition to walking properly? How can we expect to succeed on a new path if we can’t even handle the transition with ease and lightness? How much does your heart weigh? Make it as light as a feather, then perhaps Anpu will open the door for your new path. The Kemetic (ancient Egyptian) hieroglyph for the word "Love" is a man with a hoe bent over and tilling the land. He is in essence cultivating the land in order to cause the crop to grow and manifest. This is a very different notion of our westernized notion of romantic love, which is sort of a dreamy eyed feeling of attraction for someone which we fall in and out of frequently. This Kemetic notion of love demonstrates that labor, work or effort is implicit in the act of love. This does not mean that emotion and feeling is not involved, only that there is much more to it after those initial feelings have left. True love is the labor that is put into something or the effort you place into maintaining a relationship. In this sense love is not blind. It is directed with the purpose of creating the result of a flourishing crop that will then feed and sustain you. There is science behind the method of agriculture and their is science behind the methodology of love. True love is transformational for both the loved and the lover. Love is the science of transformation and transmutation. Love emerges from the Mind of the All and has reason and is directed with purpose. Love is not viable without knowledge of self. Love is not viable without love of self as the starting point.